The Piwigo Plug-in allows you to export photos from Adobe Lightroom directly to a Piwigo hosting service. Piwigo is a photo gallery software for the web that comes with powerful features for publishing and managing your photo collection. 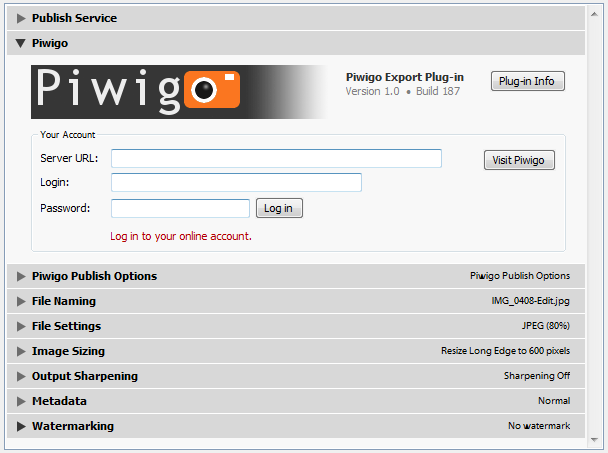 Piwigo Export Options and Piwigo Publish Option section are unavailable (grayed out). Reclaim Photos now works correctly when HTTP Access Authentication is in effect (i.e. when a Piwigo installation is protected with .htaccess). Fixed the issue with splitting keywords containing spaces into multiple keywords. Fixed the "Error processing server response" error when exported photos have no keywords. Added support for Piwigo 2.9. Publish Service: 2-way metadata synchronization. Now photo tags, photo titles and description can be pulled from Piwigo back to Lightroom. Private Albums: Fixed the issue with associating Lightroom collections with private albums on Piwigo. Publish Service - fixed the error in Sync Metadata. Soring photos in album now works much faster thanks to the improvements in Piwigo 2.8.0 API. Added the ability to upload photos in raw (DNG, CR2, NEF) format. Requires Piwigo 2.8.0 or above. Added the ability to turn an album public or private. Requires Piwigo 2.5.0 or above. Added support for video uploads. Requires Piwigo 2.8.3 or above. Publish Service - on successful creation of a new Piwigo publish service the plugin now prompts the user to import existing albums. Fixed the issue with synchronizing photo tags incorrectly in some situations. Import Albums: fixed the issue with the album structure being incorrect in some cases. Reclaim Photos: the plugin now ignores non-photo and non-vide files. Reclaim Photos: very lange files (over 100 MB in size) cause Lightroom to lock up. Now the plugin skips them. Publish Service: new major feature - Reclaim Photos. Now you can download Piwigo photos the server to your hard drive and import them to your albums. Fixed the issue with the photo creation date being set incorrectly in some cases. Export Dialog: now switching between export profiles works correctly. Export Dialog - removed the unused Sort Order option for albums. Create Super Album - fixed the "? :0: attempt to perform arithmetic on field 'countHandled' (a nil value)" error. Fixed the issue with performance settings not being retained. Fixed the issue with cross-album publishing where photos might start creating duplicates at Piwigo after editing and re-publishing. Added the option for turning off cross-album publishing for improved performance. Removed the now obsolte option for using chunked uploads. Now the chunked upload method is used automatically when possible. Fixed the issue with dropping off suffixes from filenames containing a period. Export Dialog: Fixed "Assertion Error" when running an older version of Piwigo. Export Dialog: restored the Piwigo Export Options section. Added support for TIFF uploads (requires Piwigo 2.6.0 and newer). NOTE: your Piwigo installation must be configured to handle TIFF files. Export Dialog: Implemented a persistent caching mechanism allowing the dialog to load known albums much faster. Export Dialog: Re-designed the layout. Fixed a rare error when servers reject the pwg.images.checkUpload call. Fixed: Keyword tags are not being applied when the "Include parent keywords" option is turned off. Fixed the issue with republishing photos that were deleted through Piwigo's web console. Added the ability to control whether parent keywords should be included when using the Keyword Filtering feature. Now the status line in the "Your Account" section displays the e-mail address of the currently logged in user. Restored the "Synchronize Comments and Ratings" option which was accidentally removed in a recent update. Fixed the issue with occasional loss of the activation state. Fixed the error when using advanced authentication options (HTTP Authentication). Added validation of the user privacy level to avoid the situation when the Lightroom user is unable to access uploaded photos because of an insufficient privacy level. Fixed the missing time part of the photo creation date when using chunked uploads. Fixed several compatibility issues with Piwigo 2.6.x: handling of duplicate photos on export, associate images. Performance tuning options are now part of Export Settings to enable fine-tuning individual publishing services and export presets. Added the ability to customize server timeout settings in situations where the default 30 seconds interval is insufficient. Associate Images: Now you can fine-tune association by File Number Suffix by specifying the characters that should be considered part of the suffix. Publish Service: Fixed the "deletedCallback: remotePhotoId is invalid" error when deleting published photos in some situations. Implemented detection of URL redirects on the server. Fixed the "? :0: attempt to call method 'getAlbumSet'" error. Fixed the issue with being unable to log in after changing the password. Fixed the issue with deleting published photos. Sub-albums are being created the top level. The plugin ocasionally throws an "Unexpected server response, HTTP Error Code 403" error. Fixed the "attempt to call field 'APH_getAlbumInfo' (a nil value)" error when renaming albums. Synchronize Metadata: fixed the "attempt to index a nil value" error. Fixed a rare error "bad argument #2 to 'format'" . Publish Service: fixed the error when reparenting an album. Check Photos: fixed the "access to an undefined variable: fileName" error. Export Dialog: the top level of the album hierarchy is now visually separated from real albums. Fixed the issue with authenticating after a password change. Mac OS: Fixed the issue with customizing templates for photo titles and description. Publish Service: Added the ability to convert albums and album sets into "Super Albums" for managing photos AND albums within a single Piwigo album. Now provides the ability to customize photo titles and descriptions using templates that support different combinations of metadata and static text. Import Albums Structure - Fixed the "Access to an undefined variable: collections" error when processing albums containing both photos and sub-albums. Export Dialog - fixed the issue with creating new albums. Now the visibility level of individual photos can be controlled using the new "Visibility Level" located on the Metadata panel, in the "Piwigo Metadata" section. Fixed the "C stack overflow" error on Mac OS. Extras: Import Albums - fixed the "internal error: bad argument #1 to 'ipairs' (expected table, got nil)" when albums contain both photos and sub-albums. Extras - New feature "Find Photos with Comments" enables you to quickly identify published photos that received online comments or ratings. Extras - The "Set Album Cover" feature now works correctly. Fixed the issue with exporting parent keywords when using the Keyword Filtering feature. Fixed the issue with using album-specific resize options. Fixed the "Can't update this collection. An internal error has occurred: ? :0: attempt to compare number with nil" when synchronizing ratings for albums that does not have any rated photos. Opening the Lightroom Publishing Manager panel and logging into Piwigo no longer triggers the "Not Saved" state unless you actually modify one of publishing options. Fixed: Lightoom hangs during uploads. Fixed the issue with uploading keyword tags in Piwigo 2.5. Implemented a workaround for the "Error parsing server response" error when Piwigo API responses contain PHP notices. The plugin is now fully compatible with Piwigo 2.5. Implmented a workaround for a Windows specific HTTP Error 12032 (the action must be retried). This is a quick fix for the issue in version 1.10.0 causing the plugin to lose its registered status. Publish Service: added the ability to control image settings (size, JPEG quality) for each album individually. Publish Service: now "Associate Images" populates Piwigo Metadata fields correctly. Publish Service: now "Check Photos" clears Piwigo Metadata fields if photos are no longer published through the Piwigo publishing service. Fixed: multiple whitespaces in keyword tags cause errors when republishing photos. Fixed: field caption in Keyword Filtering - Inclusion Rules reads "Exclusion Rules". New feature - Keyword Filters. Now you can exclude individual keywords or entire keyword trees from the export. For explanation, see the FAQ page. Fixed the issue with updating photos published to multiple albums when one of the albums no longer exists on Piwigo. Now keyword tags can be not only added but also removed when re-exporting photos. Improved generation of photo URLs in the Piwigo section on the Metadata panel. Extras - Associate Photos: Added a new method of resolving matching conflicts - now you can prioritize pairing of rendered JPEG copies over raw originals. Extras - Associate Photos: Added new matching method "By File Number Suffix" which compares only numeric image suffixes when searching for pairing candidates. Extras - Associate Photos: Added new matching method "By File Number Suffix and Capture Time" which chooses candidates based on the combination of the numeric image suffix and photo capture time. Extras - Associate Photos: Now when associating photos by capture time you can specify a timezone offset to compensate for the time difference between the server and the local computer, if needed. Fixed the 'Missing "method" name' error in Lightroom 2 and 3. Fixed the "Tag already exists" error in Piwigo environments using the TypeT@gs plugin. Fixed the issue with applying tag ID instead of keywords when the Chunked Uploads option is turned off. Publish Service: Fixed the issue with the "HTTP Authentication Required" message popping up when navigating between albums. Fixed the issue with visibility keywords sometimes not working as expected. Fixed the issue with visibility keywords not being applied on republish and sync metadata. The "Create Keywords" action has been relocated to the Plug-in Extras menu so it can be accessed even when there are no Piwigo publish services in the catalog. Fixed the intermittent error 'Missing "method" name' causing some uploads to fail. Improved the display of rendering and uploading phases on Lightroom's progress indicator. Now you can control the visibility level of uploaded photos. You can specify the default level and also control the visibility level of individual photos using special keywords. Fixed a rare issue related to publishing photos into multiple albums. Fixed the "attempt to index local 'headers' (a nil value)" error when the server rejects the uploaded photo. Added validation of album names. Export: fixed a few minor issues with the Export dialog screen. Export: fixed the issue with not saving the password in export presets. Publish Service: Fixed the "You did not specify the Server URL" error when attempting to re-parent an album. Publish Service: Fixed the error when attempting to customize the cover photo for an album. Fixed the issue with exporting or publishing images with empty "Capture Date" in their metadata. The plug-in is now compatible with Piwigo 2.4.0. Added backward compatibility with Lightroom 2. Added support for hosting environments with HTTP Access Authentication (RFC2617). Added support for Export operations. Improved error handling when server response is empty. Improved validation of the server address. Improved behavior of the "Associate Photos using File Name and Capture Time" function when Piwigo metadata is missing the time part. Fixed several glitches in the Export dialog. Added compatibility with Piwigo 2.4.0 RC3. Sync Metadata - photos failed to syncrhonize are now displayed in a list box at the end of the operation, allowing to save the list to a text file. Implemented the ability to reduce server load in a hosted environment by specifying a throttling interval for photo upload requests. Added the option to turn the "Chunked Uploads" on and off. Album thumnails are now generating of the correct size. Added support for chunked uploads (requires Piwigo 2.3.3 and above). This is a major change targeted for customers who are unable to control their PHP environments and increase post size limits to handle large uploads (low post size limits is a typical issue for customers on shared hosting). Chunked uploads transfer photos in small chunks of only 200 KB, which should be sufficient to circumvent even the most rigorous post size limits. Added support for file renaming. Now "Synchronize Metadata" also updates the file name of the photo if the name is changed in Lightroom. Implemented additional safeguards for PHP notices, warnings, and errors that could affect the interaction between the plug-in and Piwigo API. Improved diagnostic of upload errors caused by configuration and permission related issues on the server. Added an option to turn off synchronization of photo comments and ratings which allows improving performance when you are not using comments. Now server responses are being sanitized to prevent response parsing errors in situations when the E_NOTICE option is enabled in the PHP configuration. Fixed the "image_id not found" error when a previously published photo is removed on Piwigo side. Fixed: pairing photos works incorrectly when there are more than 500 photos in the online album. Improved error reporting when Internet connection is interrupted or blocked by the firewall. Fix: "Synchronize Metadata" fails to update photo tags. Fixed: In some cases "Synchronize Metadata" and "Unmark for Re-Publish" functions can produce a "No photos selected" error even when there are selected photos. The Extras dialog now detects the active publish service automatically based on the selection in the Publish Services panel. Fixed some formatting issues in the French translation. Menu items in the publish service's pop-up menu are now localized. Losing Internet connection during photo uploads is now handled correctly. Added the ability to retry uploading individual photos when the server times out during the upload or rejects a photo. Improved plug-in's stability in case of intermittent network failures. Added the ability to control the resolution of uploaded images. Added the option to turn off automatic validation of Image Sizing settings. The inadvertently removed in version 1.4.1 "Synchronize Metadata" function is back on the Extras screen. Fixed the "image_id not found" error when re-publishing or retrieving comments for a photo that no longer exists on Piwigo. Deleting a non-published album no longer suggests leaving the album online. Now the "Extras" operations display provide feedback via summary messages at the end of processing. Import Album Structure no longer creates duplicate albums for existing smart collections. Fixed some errors in the French translation. Now before deleting albums the plug-in checks if there are photos on the Piwigo service and issues a more comprehensive warning message than the default Lightroom's one. Implemented a change for the upcoming Piwigo 2.2 that will allow to retain existing comments and ratings when re-publishing photos. Implemented a workaround for the "There is something wrong with CryptUnprotectData" error. Now updating keyword tags will automatically mark affected photos for re-publishing. NOTE: If you have an earlier version of the plug-in installed, you must modify the Piwigo Publish Service settings for the fix to take effect. Simply go to the Lightroom Publishing Manager, log-in, then check/un-check any check-box - this will enable the Save button. Return the check box in its original state and click Save. Fixed issues with using multiple publish services. Added a check to ensure that the server is ready to accept uploads from the user. Fixed the "error code1003 invalid category_id" error when trying to upload to a new album. Fixed the issue with navigating to an unpublished album. Instead of a "URL not found" error, now you get a message explaining that the album has not been published. This update is mostly code optimizations and slightly improved handling of the situations when previously published photos and albums are removed from Piwigo outsize of Lightroom. Fixed the issue of re-parenting albums contained in an album set to the top level of album hierarchy. Fixed the "attempt to index global 'propertyTable'" error when saving connection settings. Fixed the issue with creating new publish services. Found and fixed a rather intricate bug related to republishing a photo that has been deleted from Piwigo service, if the photo had originally been published to multiple albums. When a photo has been deleted from Piwigo service, "Go to photo in Piwigo" now displays an intelligent error message instead of trying to open a non-existent page in the web browser. Fixed the "attempt to index field '?'" error when editing settings for an album set which no longer exists on Piwigo. Now the "Edit Album Set..." dialog allows you to edit the comment for an album set. Now the privacy level for uploaded photos is zero (Everyone). NOTE: It will be possible to control the privacy level in a following version of the plug-in. Fixed the issue with publishing additional photos to an already existing album. #202 fixes the issue with failure to re-publish an already published photo. Fixed the error when trying to re-publish an already published photo. This the initial release of the beta version. Thanks, I have just rolled out build #302 with the fix for the issue. Please re-download. Simply thanks for this application that we dreamed for a long time ! very great and cool plugin, perfect work under win7x64, Lightroom 3.3 and new Piwigo 2.20. Thanks Philippe, I fixed the date, thanks for letting me know! Great tool – thanks so much for your effort! I love it! I have just problem that bothers me alot. I upload a lot of photos from Lightroom to my piwigo Server – most of time over night because it takes a lot of time and during the night I don't need my notebook for the daily business. On the next morning the upload finished just of 400 pictures instead of 1000 or just 3 instead of 10 folders. My biggest wish! : I wish me to have a the option to "ignore Messages" and instead to continue uploading with next folder or next picture. It would be amazing if you could implement this feature – like a silent mode!!!! I'm giving a try to the plugin demo version before buying it. – Some photos does not seem to upload correctly. When I upload multiple photos in a good quality, I do see the album with the correct number of photo but all their sizes are 0Kb and I cannot view them. This issue seems to depend on the photo size, when I reduce the JPEG quality some photos are correctly uploaded and other not. The plug-in can use the same upload method as the pLoad, you just need to enable the “chunked upload” option. Keep in mind though, when the memory limit on the server is low you still may be unable to upload, however in that case both pLoaded and my plug-in would fail. Unfortunately, Piwigo doesn't "get" the tags I entered in Lightroom. He only displays numbers as tags. All options are "on" in the metadata box from the plugin panel in Lightroom. Am I missing something ? Yep, the issue is confirmed – this happens when the Chunked Uploads option is turned off. I am making a fix and re-uploading version 1.8.3. Hmm… I've found my tags in Piwigo but he calls them "orphan tags". They are not associated with any photos… Any idea ? Problem solved. A huge thank for your help Vladimir!!! Does this plugin work to publish videos? Is there any chance you will be adding this in the future? Piwigo API does not support video uploads and that is the only reason the plugin is unable to publish videos. plugin is great, however I can't reach advanced functions under "Plugin Extras" – there is no entry for this plugin. I can see other plugin's functions there, but nothing for this one. I tried disable/enable, reload… no change. Any hint? I suspect you are looking in the wrong place. The Extras are located in Library > Plug-in Extras. You can also access all “extras” right from the Publishing Manager – double-click your Piwigo publishing service and scroll down a little. You are right! How confusing, that "Plugin Extras" are both under File as well as under Library, and there are different things. Lightroom reserves three places for plugin extras: File > Plug-in Extras, Library > Plug-in Extras, and Help > Plug-in Extras – each of these locations imply a certain context and functionality. Library > Plug-in Extras is the only appropriate locations for publish service related features. The ability to change the type of an existing Album/Smart Album/Album Set. For example to convert existing albums from "Album" to "Smart Album" at the click of a button. I've only just realised the amazing feature of "Importing Albums" and "Associating Images" from existing Piwigo systems. Only problem is that I've just imported 200+ albums (about 5,000 photos) from one install, and I need a way to convert most of the Albums to "Smart Albums" so that new images become available based on specified tags. I've deleted one or two of the existing Albums that I desperately needed to re-create as a Smart Album. But I've found the biggest problem with this being it causes links to the Albums ID to become invalid (bad for e-mailed links) and looses image ratings, descriptions from pictures. It would be so great if, at a click of a button, the Album type could be changed without the pain of re-creating the Albums. It would make your great plugin, amazing! Is it possible to change the privacy settings of photos via the plugin? For example, if I upload a large set of photos (available only to Family) into an album, and then want to make a subset of those available to Friends & Family. I tried changing the default privacy settings on the Publish Service and republishing the subset, but it failed. The Visibility Level option in Piwigo Publish Options should be applied during the upload. I am going to double-check if there are any issues around this. Could you upload a couple of photos and submit your debug log, so I can see if it’s being applied? Great plugin, but why does it not support color space conversion? That would make it really useable for Lightroom. The exported JPG's has no profile assigned which makes them look much to saturated. I would love to be able to upload the photos, but also upload the DNG files associated with those files as an alternative download. Something tells me it would be a plug in for Piwigo along with for Lightroom, but certainly something I would pay for. It would make workflow with multiple people very smooth. Piwigo accepts only files it can visualize. But I will convey your idea to Piwigo developers. Once the gallery supports raw format (at least for storage), adding this feature to my plugin won’t be difficult. 1 – Where is stored the comments in lightroom ? Is it a standard field in iptc or xmp ? 2 – With VideoJS, piwigo can store videos. Is there any possibility to integrate it into your plugin ? 2. Piwigo API doesn’t support video uploads, and that is why videos cannot be uploaded to Piwigo from external applications via API calls. #33 | Written by rmedgbert about 3 years ago. Looks like that issue may have now been resolved pending inclusion in a future release. I’m curious how anyone has been able to upload video to a hosted Piwigo.com portfolio as I don’t see any plug-ins available to install to my account hosted there. One of your comments regarding repro steps led me to believe you may have been able to do so with such an account, please confirm. #34 | Written by Vlad about 3 years ago. I enabled the VideoJS in my piwigo account – it was listed among other available plugins. Perhaps you should contact the piwigo team to have the plugin enabled? I am not sure how their accounts are set up. #35 | Written by Tom about 3 years ago. Oh yes, managing videos in Piwigo with Lightroom is one missing piece of the puzzle. I tried today to apply the updates, but I had an error : “? :0: attempt to index a nul value”. What is it, please ? Please restart Lightroom, this will take care of the error. The auto-update mechanism has been re-designed, so you should no longer see that error going forward. Thank you. I have restarted Lightroom, but it doesn’t find Piwigo any more ! Please, what can I do ? It is quite possible that a failure triggered Lightroom to turn the plugin off. Go File > Plug-in Manager…, find Piwigo in the list of installed plugins, and select it. In the main panel, expand the Status section and click “Enable” to turn the plugin back on. Thank you very much, all is OK now ! This is an excellent plugin! I had an issue which I brought to Vladimir’s attention; he came up with a solution to address the problem right away. This plugin really improves our efficiency in working with Piwigo. I know we would not be using Piwigo today if we didn’t have this plugin. Thanks!